Do you need a wheelchair to help someone in your family get around? Perhaps you are struggling to move from place to place in your home or you have an elderly parent or relative that needs a little extra help ! You don’t want to get them something that doesn’t protect them or keep them safe, so you might as well get them the best ! This is where Drive Medical comes in. They make products that are safe enough to use every day. 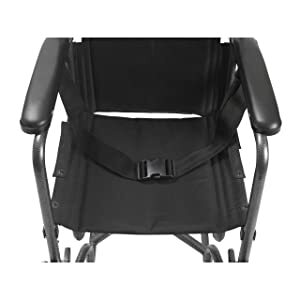 One such product is the Drive Lightweight Transport Wheelchair, which can be a real lifesaver. Unlike traditional wheelchairs, this one has 4 small wheels instead of having 2 small wheels and 2 large ones. This allows for you to get around small spaces easier and it can be utilized more efficiently if you are on an outing or have to run an errand. This wheelchair has a lot going for it. Since it is designed for transport and not hospital use, it is a little bit smaller. That is great for when you need to get it out of the way or store it because you can simply fold it down and move it easily. The back portion of the chair folds down, to make it even easier to keep somewhere out of sight. The whole chair only weighs around 25 pounds, so it won’t break your back. Back folds for ultra compact transport or storage. It has an attractive finish over its steel structure, which is the reason why it’s so versatile and strong. It is able to hold up to 250 pounds and has a safety belt for a little extra security in case the person using it is rather small or light. 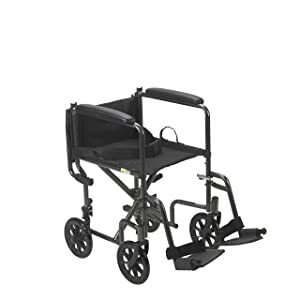 For example, if you are using this on your elderly grandparent, you can put the seat belt on them when you’re wheeling them around, so when you hit a bump or have to stop unexpectedly, they won’t shift too much or go flying. Safety belt for added security. Other things that make this item great are the fact that the arms have extra padding and that you can lock the wheels up in the back to keep the chair from moving or rolling. 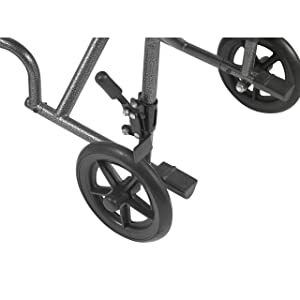 The front wheels are fitted with casters, so they are able to move around at more angles. This helps the chair maneuver around in smaller spaces and more efficiently. The whole thing is easy to clean, since it is mostly constructed of steel and nylon, so you can just wipe up any spills or messes. Simple back clasp allows super quick folding. The chair comes in different sizes and styles, and you are able to purchase additional parts for different functionality. One thing you can buy is a cup holder, if it is needed. This means you are able to personalize the chair to make it more comfortable and so the person using it won’t be left wanting features that this wheelchair is unable to provide. However, everyone that has used the chair doesn’t love it. 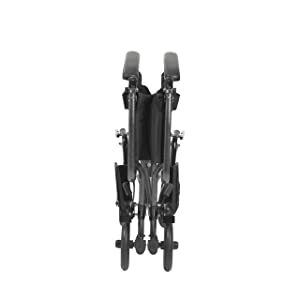 Some people feel that the leg portions should be able to be folded down, as they get in the way and can become damaged if not stored properly. This mainly an issue if someone is using it alone, as they need to be able to move their feet so they can get the chair moving. If someone is pushing it, this won’t make that much difference, as you can sit your feet in the foot holds to keep them safe. Besides that, you may need to get more cushioning on the seat of the chair. You can do this by buying a special pad or pillow, so someone doesn’t hurt their back or become uncomfortable when they are in this wheelchair. This isn’t really a big deal, as it is just a few extra dollars to find a nice memory foam pad, although some people believe it should have been included with this item. Even with those minor flaws, many people that use this chair really like it. They appreciate that you can fold it up to store it and that it can accommodate many different sizes of people. They also love that it is able to fit into most trunks because of its compact size and fits through narrow doorways, which most other types of wheelchairs will not do. It also comes with a lifetime limited warranty, which is always a good sign that a product is made properly. Whether you are using this yourself or purchasing it to make someone else’s life easier, the first thing to consider is the price. 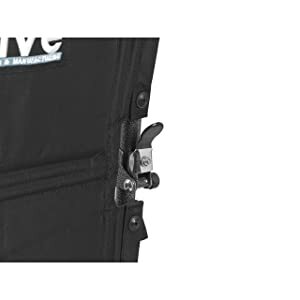 The Drive Lightweight Transport Wheelchair have price Currently Not Available*, which means it is worth the money, even if you only use it every now and then. 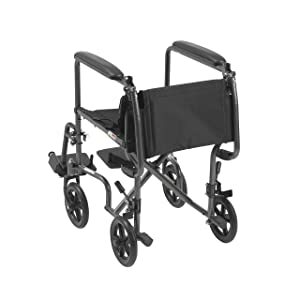 Don’t hesitate to buy this wheelchair now because it is so easy to use and care for. >>> Shop It at Amazon.com NOW ! It is also able to be used every day, so you don’t have to worry about the quality if you need to use it each day. It will definitely save you time and can be used easily in even tight or small spaces, which you don’t find in many other models out there. The fact that you can clean this one thoroughly and that it can fold down small enough to put into a car trunk or place out of the way is something that makes this one even more attractive.